Ah! This is one of our favorite areas of interest. Our first interactive book was online in 1995. 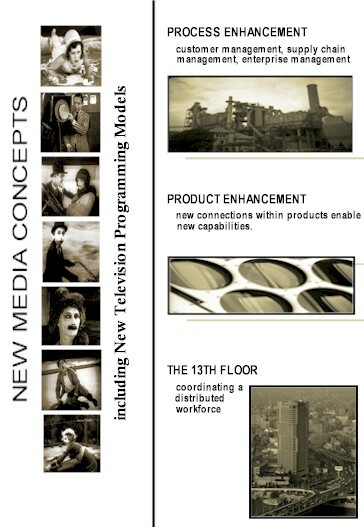 Our first interactive television programming model was conceived in 1996. Since then we've developed new "mixed media" business models; interactive scripting and mixed media presentation techniques; and redefined television programming and music product concepts. As you start to think about live broadcast, cable, pay-per-view, dvd, and websites; and as you think about the new capabilities created through the connection of computers, media and viewers ......well.... you realize that the entertainment industy - publications, film, television, music, games, cable/satelitte network services will experience a sea change in "product" definitions and delivery options. We are excited. Just ask us!